Peanuts are very country, very old-fashioned, and very American—and I love them—especially with chocolate. This cake is a cross between a brownie and chocolate cake. It’s dense, moist, and wonderfully decadent. It’s an “almost” flourless chocolate cake because I include a slice of several-day-old bread in the batter. This addition can easily be eliminated for those with gluten sensitivities or if making this cake for Passover when only flourless dishes can grace the table. You can vary this cake by using almonds or walnuts in place of the peanuts if you like, but we like peanuts and that certain bit of country charm they seem to bring to the table, even though the cake looks as chic as can be. Preheat the oven to 325°F. Grease a 9-inch/23-cm springform pan with 1 tablespoon/15 g butter. Place the pan on top of a sheet of parchment paper and trace a circle around the pan, cut it out, and place the parchment circle in the bottom of the pan to grease the underside. Flip the parchment circle over and press it into place. Set aside. Place the bread in a food processor and pulse until it is medium-coarse crumbs. Add the peanuts and peanut flour and pulse until the texture is like rough sand (don’t over process the mixture or it will become peanut butter). Use a standing mixer fitted with the paddle attachment or a large bowl (if using a hand mixer) and cream the remaining 10 tablespoons/150 g of butter until it is fluffy and pale. Add the brown sugar and cream until pale, then add the egg yolks, one at a time, mixing thoroughly between additions and scraping the bottom and sides of the bowl as needed. Add the vanilla bean paste (or extract), reduce the speed to low, and add the peanut mixture. In another bowl, whisk the egg whites with 3 tablespoons/36 g of the sugar until the whites form stiff peaks. Fold the whipped whites into the batter in three additions, adding the grated chocolate along with the last addition, folding until just a few streaks of white remain. Scrape the mixture into the prepared cake pan and bake until the sides pull away from the edges of the pan and a cake tester inserted into the center of the cake comes out clean, 45 to 50 minutes. Remove the cake from the oven and set on a wire cooling rack for 5 minutes before releasing the latch and lifting the side of the pan away from the bottom. Cool completely before inverting the cake onto a large flat plate, cutting board, or baking sheet lifting off the pan bottom, and peeling away the parchment circle. Reinvert the cake onto a cake plate or platter. Place the remaining 2/3 cup/130 g of sugar and 2/3 cup/160 ml of cold water into a small saucepan. Cook, stirring, over medium heat until the sugar dissolves, and then let the sugar simmer, swirling the pan occasionally, until the liquid becomes an amber-color caramel. Remove from the heat immediately and, using an offset spatula, pour and spread the caramel syrup over the top of the cake. Cool the cake and then slice and serve at room temperature. Chocolate-Peanut Torte adapted from Masala Farm (Chronicle Books) to be published in Fall 2011. 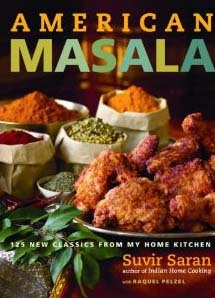 Click here to purchase American Masala for purchase on Amazon.